The annual Family Centre Beach Bash will be held on Saturday, September 15 at 7.00pm at the Fairmont Southampton Ocean Club Beach and seats are now on sale. 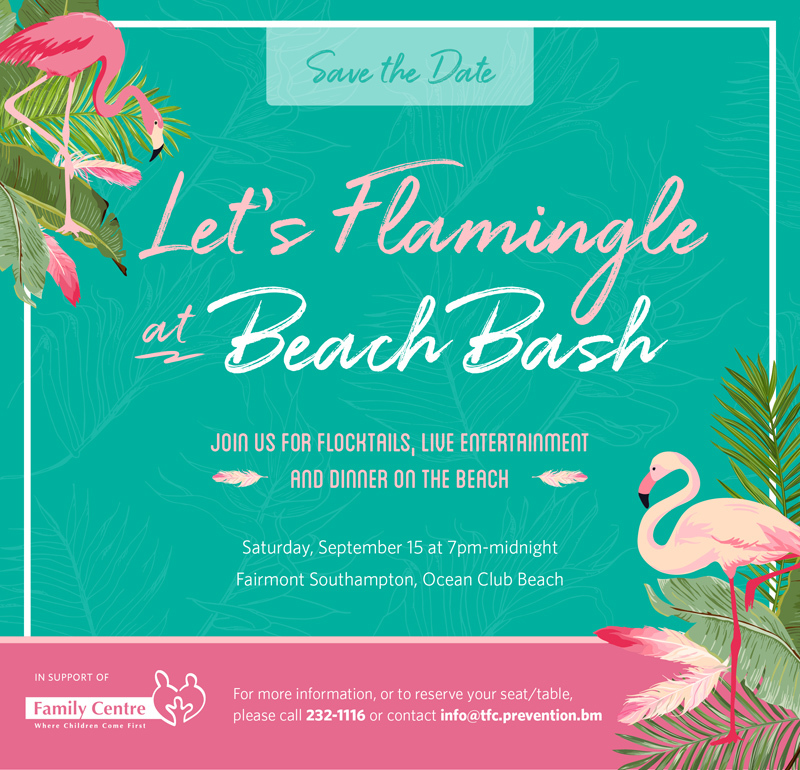 A spokesperson said, “Family Centre’s annual Beach Bash will take place this year on Saturday, September 15 at 7pm at the Fairmont Southampton Ocean Club beach and seats are now on sale! This year the event will have a Pink Flamingo theme so guests are encouraged to come ready to party in pink! “Guests will enjoy a complimentary welcome signature drink from Gosling’s or a complimentary Ashley’s Lemonade and a wonderful food station barbeque on the beach,” the Family Centre said. “The event also highlights Bermuda’s incredible local talent, showcasing music from The B Sharps, Warwick Academy Primary Choir, One SOULution and Working Title. “There will be a raffle draw with prizes including a brand-new Honda Activa 2018 Scooter from ScooterMart and a One Night Stay in an Ocean View Room at Coral Beach & Tennis Club including Breakfast and Afternoon Tea. Raffle tickets are available in advance and you don’t have to be present to win! Seats are $250, at tables of ten. “Over 60 silent auction items will also be available for bidding on, including many travel possibilities from across the globe, exclusive jewelry, local adventures and more. MC, Patrina O’Connor will keep the night rolling along in her enthusiastic style, with a dynamic on-stage presence to match the tempo of the evening. “For over 25 years, Family Centre has been strengthening families in crisis and helping to break the negative cycles of abuse and neglect that plague so many Bermuda families. “We are committed to changing the lives of children in Bermuda by providing free counselling services to children and families in crisis, reaching out to at-risk children and families who wouldn’t otherwise ask for help through our community programs, and offering training and advocacy services which help ensure that children receive better opportunities for wellbeing at home, at school and in the community.